View of the Eiffel Tower from the Printemps Haussmann department store, Paris. 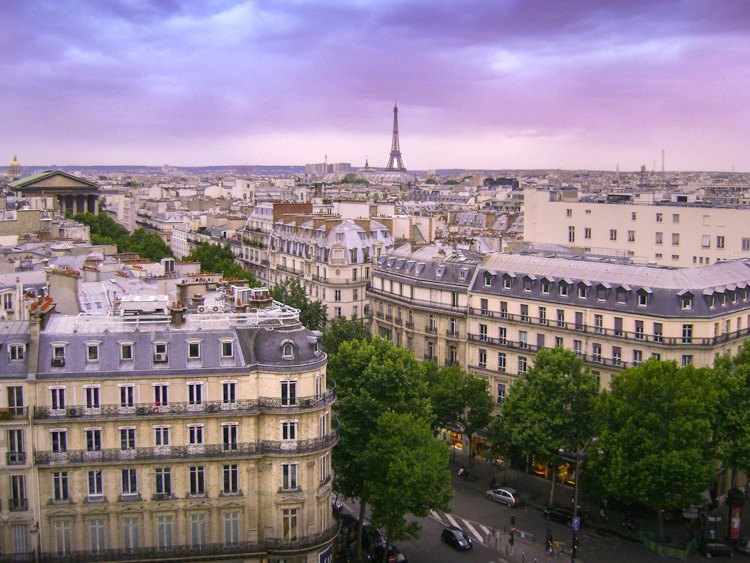 Paris will surprise you, even while letting you play out your fantasy of strolling through The City of Light or people-watching at Parisian cafés. For example, have you ever come across a place so beautiful that you wondered how on earth the locals pass by like it’s just normal? 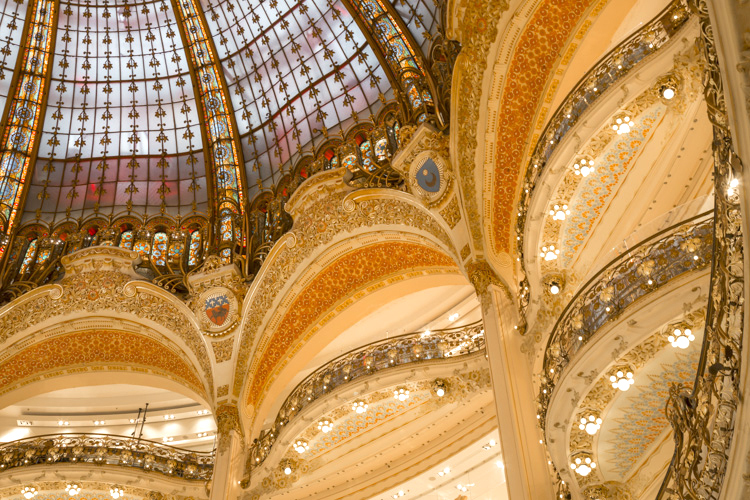 These historic department stores in Paris are amazing hidden gems, and that’s exactly how they made me feel. Few visitors know that beyond their stunning architecture and window displays, both have century-old glass domes that make you feel like you’re in a fairy tale. They will truly take your breath away. 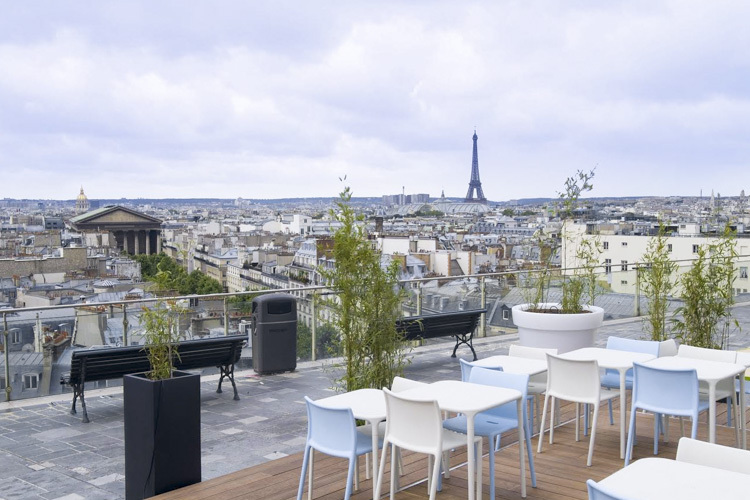 Did I mention that they both also have free rooftop terraces with panoramic views of Paris? Since the two stores are just steps from each other, it is easy to explore both places in one trip. It couldn’t be any easier too, with their location just one block from the Opera metro station. 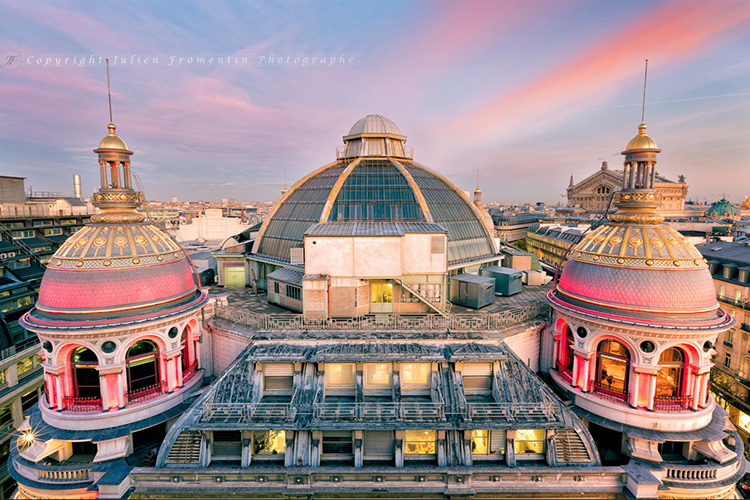 The flagship Printemps department store was opened in 1865 on Boulevard Haussmann in Paris. It was the first store anywhere to use electric lighting, and in 1867 was featured at the Universal World Fair (also known as The International Exposition). Printemps revolutionized retail business practices and is credited with pioneering innovations including the sale rack, price tags instead of price haggling, and the use of window models to display the latest fashions. The flagship Printemps store on Boulevard Haussmann in the 9th arrondissement of Paris. Photo by Julien Fromentin. Printemps department store, Paris. Photo by David McSpadden. Make your way to the 8th floor to find a fantastic 360-degree panoramic view of the city at the the Deli-Cieux café. This self-service café is a good place to enjoy a snack or just soak in the one of the best views of Paris. Deli-Cieux café on the 8th floor of Printemps Haussmann, Paris. Photo courtesy of Printemps. 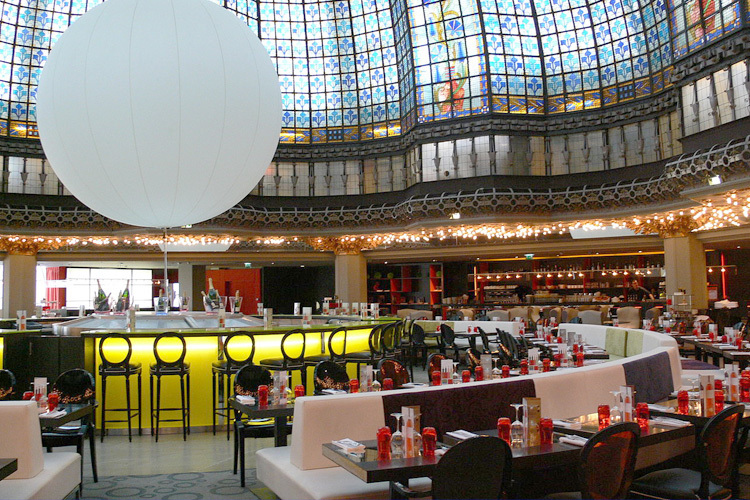 On the 6th floor, take a break to experience the magical Brasserie Printemps. Grab a seat under the stunning dome and enjoy Parisian luxury with an ice cream sundae topped with hazelnuts, a chocolate biscuit and chantilly cream. I did, and I giggled the entire time. Brasserie Printemps. Photo by Andreas Praefcke. 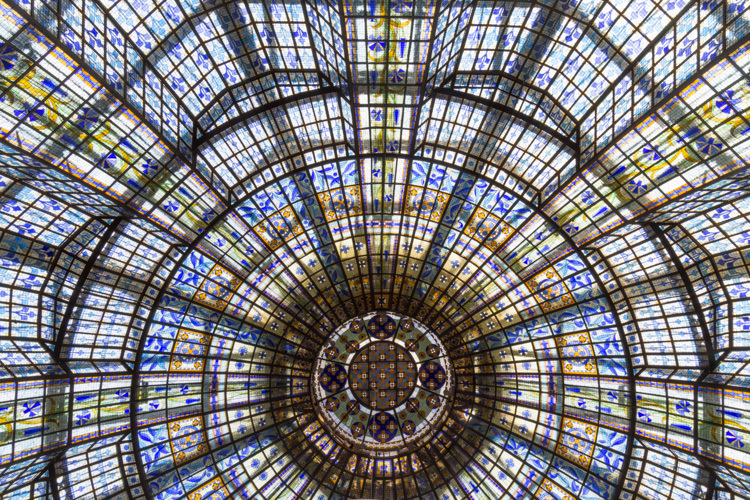 The glorious glass dome ceiling at Brasserie Printemps, Paris. Blue and gold floral details on the glass dome ceiling. 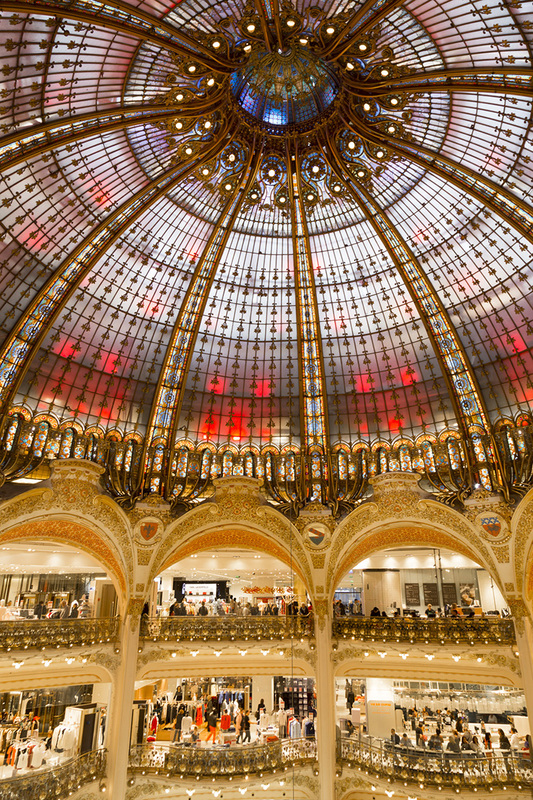 Galeries Lafayette originally opened in 1912 and is described as a Parisian luxury bazaar, emphasis on the luxury. It has locations in major cities across the world, including a couple in Paris. I learned the hard way, but it’s important to know that the one you want is called Galeries Lafayette Haussman. 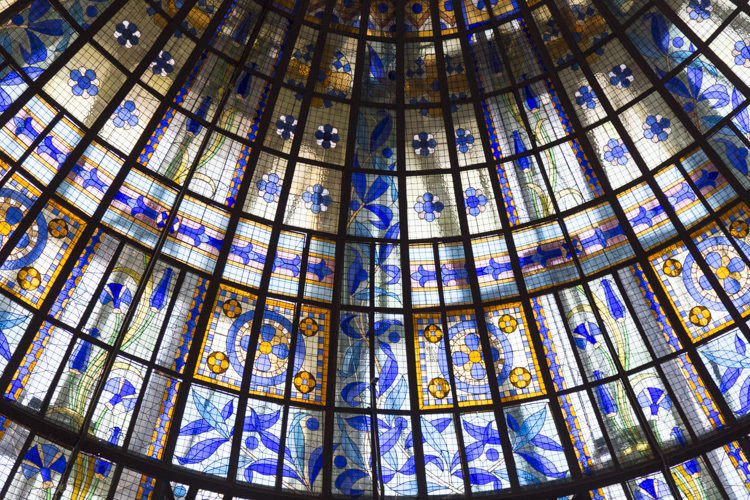 The most impressive feature of the building is the monumental glass and ironwork dome —you have to see it to believe it. It doesn’t end there. 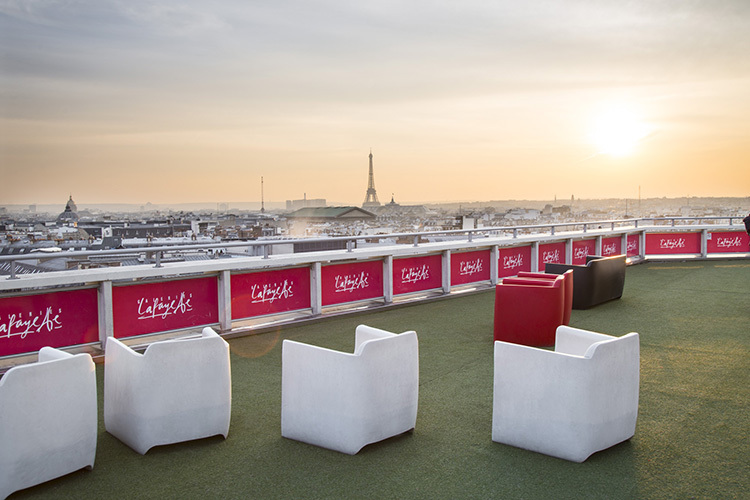 Make your way to the rooftop terrace and you’ll be rewarded with panoramic views of the Paris skyline. This one is particularly special because you’ll have a relatively close view of the Palais Garnier, Paris’ famous opera house. The Terrace at Galeries Lafayette, Paris. The Eiffel Tower as seen from the terrace at Galeries Lafayette, Paris. 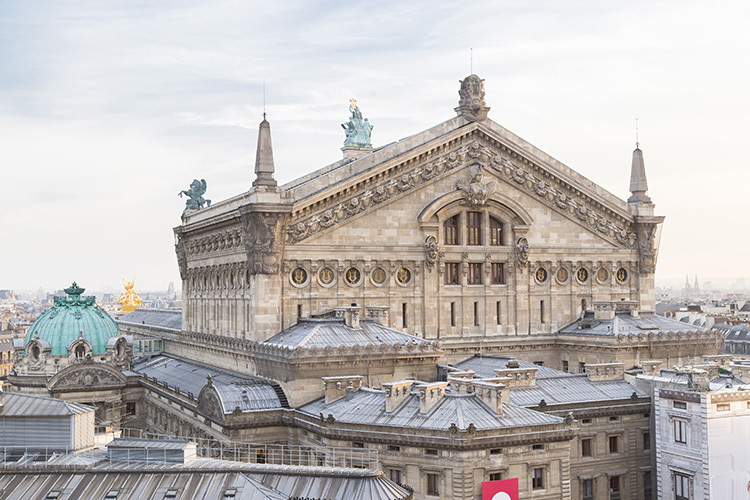 The nearby Paris opera house, Palais Garnier, as seen from the roof at Galeries Lafayette. If you are looking to buy yourself a nice treat from Paris, this might the place to do it. Who wouldn’t want something uniquely Parisian to always remember your time in Paris? 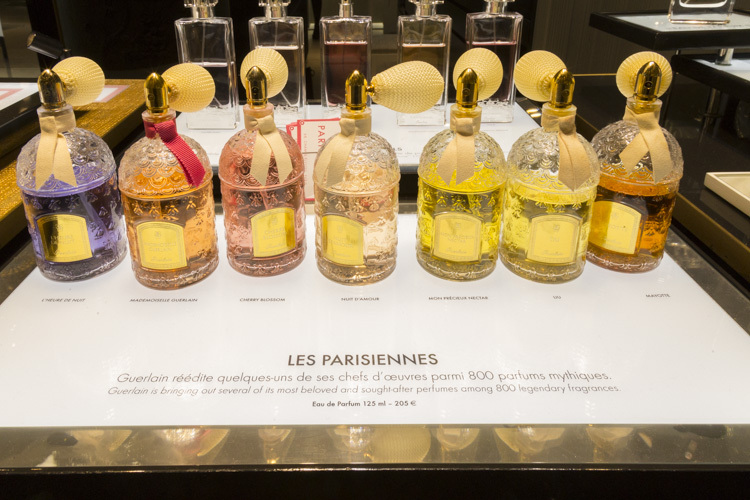 Les Parisiennes is an exclusive collection of Guerlain’s most beloved fragrances, back by popular demand. 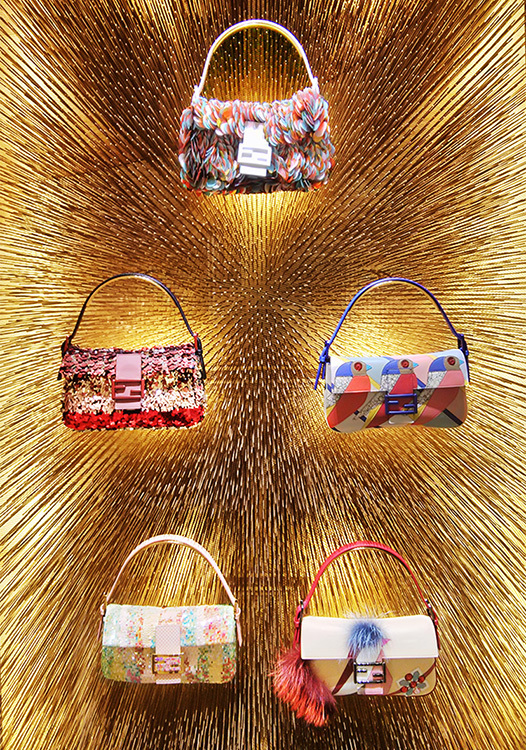 Wow, what an eye-catching window display at Galeries Lafayette! 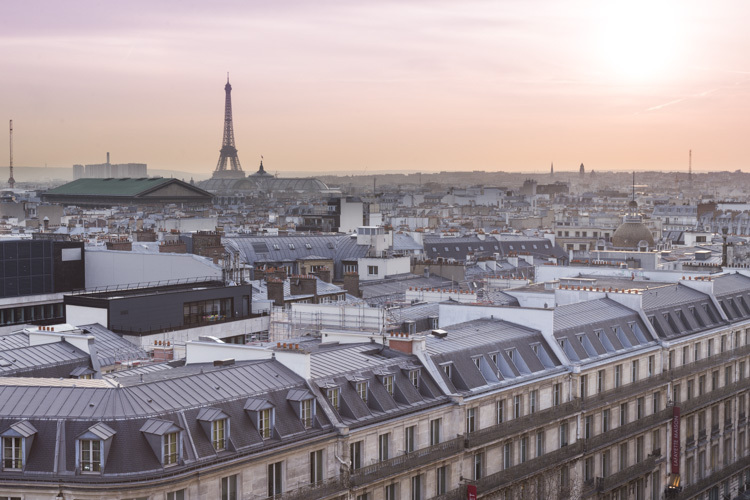 Last but not least, you can enjoy the romantic views of Paris at home by ordering prints of from one of Etsy’s top fine art photography shops, Parisian Moments. From small to large wall art and home decor, you can browse the shop here.